The first thing that you notice with this Lip Crayon is that it's not the most highly pigmented lip product, but it builds up easily. Be careful not to overdo it though as it will start to settle in cracks if you apply too much. The finish is a nicely glossy, pop of colour. It is lightweight too, so it almost feels more like a lip balm than a lipstick/gloss hybrid. Now we know that it looks good, let's talk about that big longevity claim. Let's be frank about this - you're not getting 10 hours of wear out of this product. With that said, it's interesting to look at the actual wording of the claim; it doesn't actually say 10 hours of colour, it says 10 hours of comfort and hydration. Take from that what you will. The actual wear time of this Lip Crayon is around a couple of hours, and the glossiness is the first to vanish. The colour does stick around a little while longer, so whether you choose to re-apply when the gloss fades or when the colour does is up to you. It isn't too bad transfer wise, but it won't stick around through eating too well. It is pretty good when it comes to drinking (I'm guessing that's due to the waterproof claim), but it will still decrease the length of the wear time a bit. A major plus is that it is quite hydrating, so when it has faded or been removed your lips don't feel dry. Overall, I really do like this Lip Crayon. However, I think that it can be easy to get your hopes up a bit when you see that 10 hour claim and then feel let down when you use it. The finish is glossy, and because of that you know that the longevity won't reach anywhere near that long. I do think that the wording can be a bit confusing, but it sounds great and that is what advertising is all about! 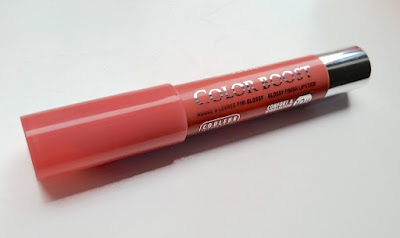 If you try this product with the idea of it being like a regular type of lip crayon product, you'll be happy. It's a great product! If you try it with the idea that you will get this extreme amount of wear and whatnot, you will probably feel disappointed and that's a shame as it's not a disappointing product. 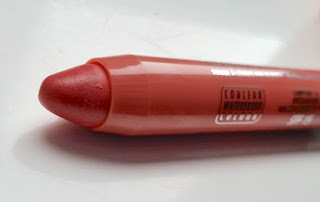 What are your thoughts on the Bourjois Colour Boost Lip Crayon's? Which one is your favourite shade?